919 – a good time to start writing. I had a bloody good birthday this year. Girlfriends, boyfriend (I mean the husband, but boyfriend matched and sounds fun), sisters, really treasured me. I was given a beautiful bodywork voucher to go see Magic Hands, I was taken out for massage, dinner and sleep-over with the sisters, I was taken out for dinner by the Auckland girlfriends, I was taken out for pud by the Tauranga girlfriends, I was taken for a womantic walk wound the Mount in the wain, to the hot pools and then a surprise restaurant quality dinner in front of a fire jacked up by the husband + a month later I was taken up the hill to a belated BYO curry dinner party with my ‘rural friends’ which was a bawdy, delicious and wanted-it-to-go-on-for-hours-more event. I think it was the best birthday ever. Maybe it means I’ve reached the happiest I’ve ever been in my life? 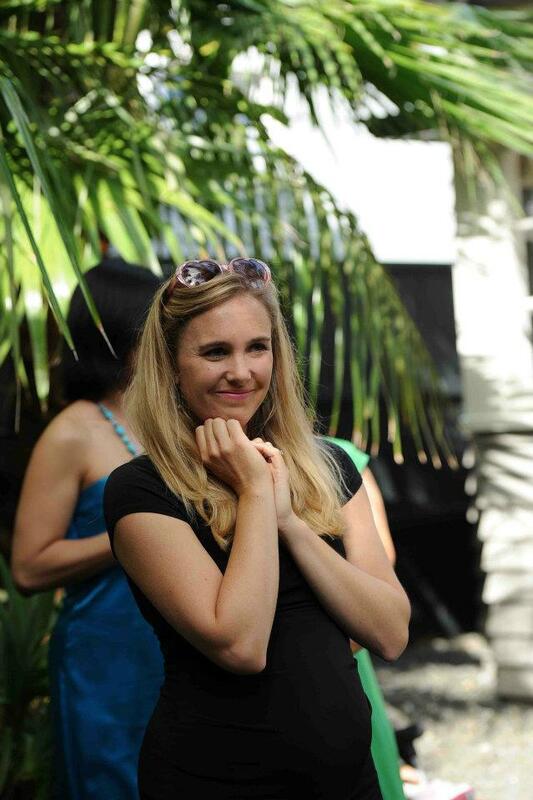 Thank you people – you gave me such love and I felt head-to-toe nourished by your presence, flavours, tales and laughter. Apart from a photo enlarged of our two girls looking out to sea ‘sliding down the wind (daughter 2)’ I was given an anti-gravity yoga class with Sezzabella Rockafella (teaching in a little YOGA festival). When she first asked if I’d like to go I was fakely keen. I thought to myself, geez louise, I’m just getting back into moving this bod, i loathe backbends (inversions), which isn’t totally true I hate hanging my head backwards but I’m alright with the back bit, have no core or pectorial strength. I tried to google stalk it behind Sarah’s back to mentally prepare – it didn’t work, I could remember the complete name. Float? Float Yoga? FLOAT FITNESS. One week I said – so are we going to do this thing? 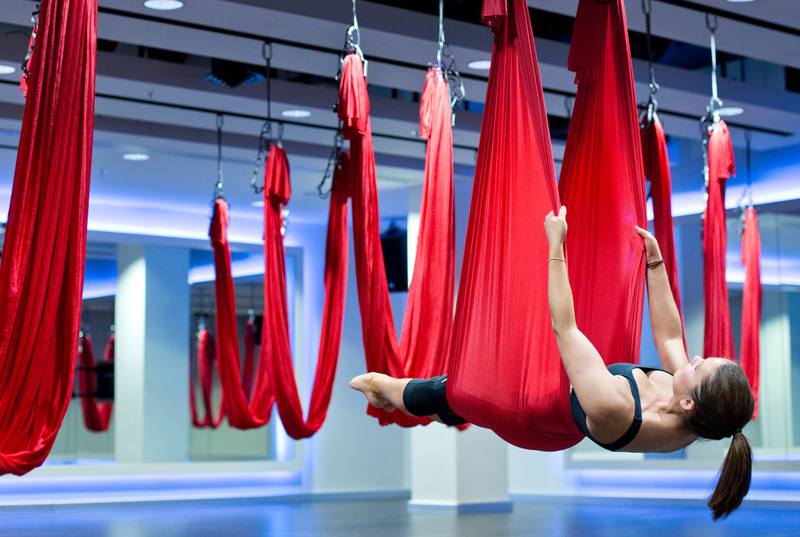 Before I knew it, it was a Sunday, I had a leave pass from the husband and we were off to try ANTI-GRAVITY Yoga. It felt professional but it didn’t entirely reassure me that I then filled out a form which highlighted any past injuries I and the teacher needed to be aware of. In the room were 5 sapphire blue silk hammocks bolted into the ceiling. I’d done a show with circus ‘The Underwatermelon Man’ in the noughties so seeing that sensational fabric pricked my interest. Everyone else (the 3 other people there) looked very athletic. I felt very Mumsie and talkative and like I imagined my Mum to look and feel in a similar scenario. Whenever I feel like my Mum makes for a rather self-conscious moment. Ah, she puts music on. Nice. Feeling more relaxed now. I will admit the one thing I didn’t feel was very ‘yoga’ about the most excellent morning was the breath. I breathed very rarely. That is of course a lie, because I am still alive. But I felt myself suspending my breath a lot, whilst I concentrated on following this unique instruction. 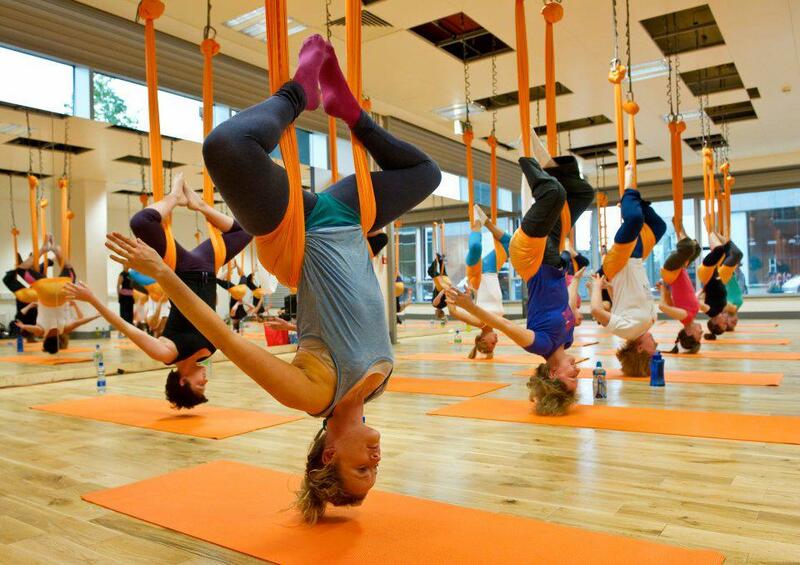 This 1 hour Sunday morning class of Anti-Gravity yoga with Frejya of Float Fitness was F U N. 100%. It was a perfect friend date. From a pragmatic perspective. 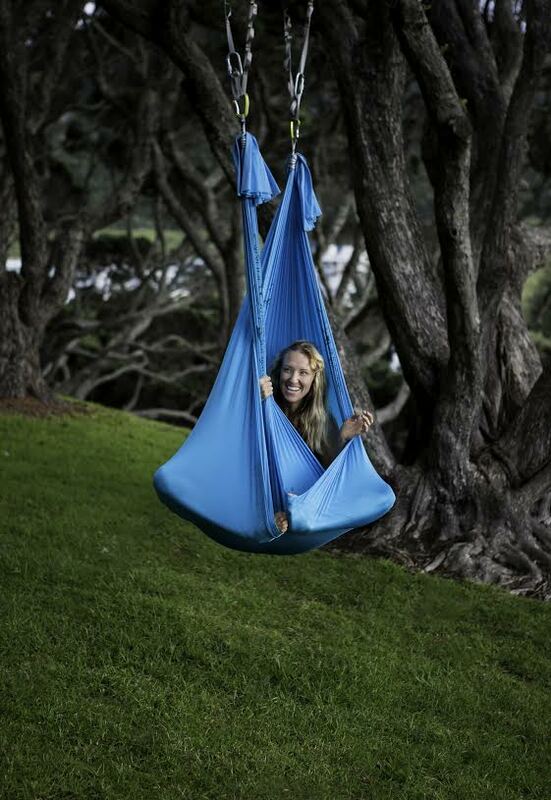 I had my own hammock, which was used in a variety of ways. Sometimes we were still, sometimes upside down. The class got more daring as the minutes built. The time didn’t drag but it didn’t race either. It didn’t feel like a ‘work’-out but the next day I could feel in my muscle aches that I had indeed used my body. There were moments I felt as if I was in the circus. Rare, but there. I couldn’t tell you the time before that, that I felt like I was in the circus. How many times have you felt like you were in a circus in your beautiful life? Generally, the class moved at a gentle pace, a few times it became free-moving (movement led by our individual breath). I always felt guided and reassured by Frejya’s instruction. There was only one moment when we had to hold our own weight for 3 seconds that I felt foolish. But hey, it’s pleasant to fail at cheating something like this. Another circus moment of a different dimension. The Clown. There were two extreme highlights for me, and they were extreme. Essentially Freyja talked us through folding the silk hammock in such a way, and then pulling ourselves up into the hammock in such a way, to set up what felt like a death-defying swinging action, which was of course a very safe and rather timid swinging action. Sarah let out a girlish weeeeeee. I…released…and a rippling belly laugh sang out as my body encased in silk pendulumed back and forth in carnival. A not so proud to highlight lowlight was my gas issue. Another reason to loathe inversions post children. I’m thankful for the music, it perhaps could have been a touch higher in volume? To end on a positive. The shavasana. Ooooh my. Go and try it. Words won’t do it justice. I’ll give you something. A wee carrot. It felt foetal. Chrysalis like. Pre-verbal and embracing. I’m going back for more in the little YOGA festival. 18-20 September 2015. Mt Maunganui. Post-note: Dear dear Claire is saving cringe factor and has given me this wee tip: if you are bothered by vaginal wind during inversion poses try inserting a “space occupier” e.g. tampon or pessary – works a treat. Claire is an extraordinary physio who specialises in women’s (pelvic floor) etc health. You can find her at Inner Strength Physiotherapy (Tauranga). I’m glad you enjoyed the inversions even though you aren’t an ‘inversion girl’ ! Absolutely, see you in that sky blue during the festival, if not before.